This is sooooo good and easy. I’m a closet finicky eater so I like that I can alter this Tosca Reno recipe by taking out some of the veggies that I don’t like. (i.e. beets) You of course could add more vegetables to this dish. Preheat oven to 375. Peel all vegetables. Quarter potatoes. Toss all vegetables in oil, rosemary, minced garlic and marjoram. 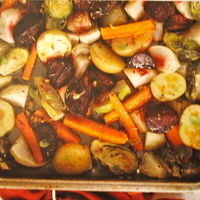 Arrange vegetables in a large roasting pan coated with cooking spray. Cover tightly with aluminum foil and bake for 35 minutes. Uncover and turn the vegetables with a large spoon. Add salt and pepper and roast at 425 for another 20 – 30 minutes or until the potatoes and carrots are thoroughly cooked but the edges are not burned. *You can learn more about my blubber battle here. This entry was posted in Food and tagged clean eating, Tosca Reno, vegetables. Bookmark the permalink. That sounds so good! Yum!